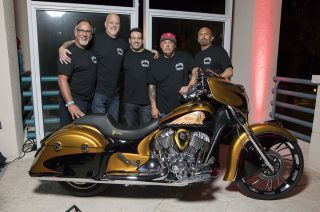 Tequila Sunset has been announced as the winning bike of Project Chieftain. 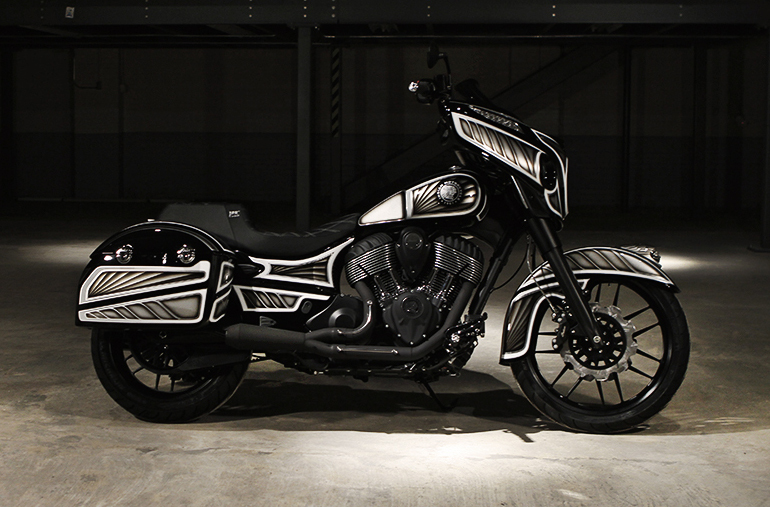 Last October, Indian Motorcycle dealers were given three months to customise either a Chieftain or Chieftain Dark Horse. They could pick any theme, style or budget, as long as it incorporated at least three genuine Indian accessories from the current catalogue. The respective dealers took home cash prizes of $20,000 for first place, $10,000 for second and $5,000 for third place. 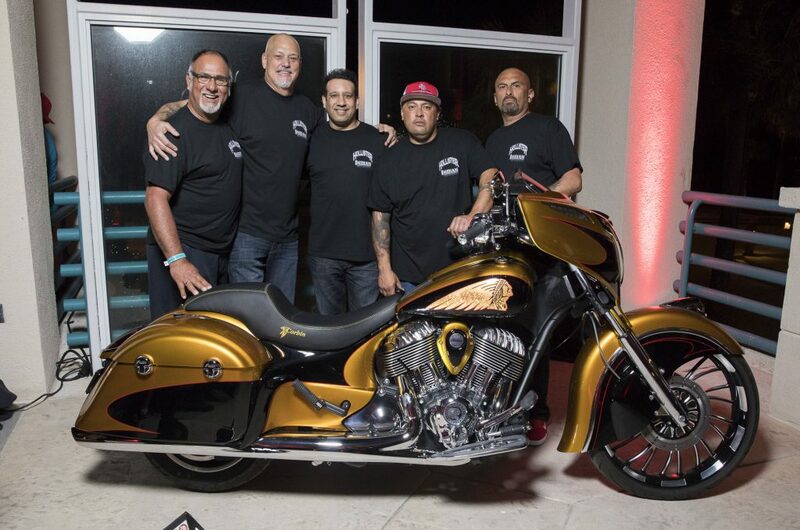 Tequila Sunset features the following modifications: a 23” custom front wheel, stretched front fender, raked triple trees, custom gold metallic paint, custom made side covers, custom made air cleaners and ‘frenched’ indicators in the saddle bags. American Proud honours the American men and women that created Indian in 1901 and recognises the team that resurrected the brand. 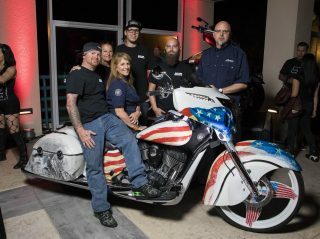 It also pays homage to the service men and women that protect our freedoms. Barnstorm was modified to elevate the aspects of the Chieftain performance platform. 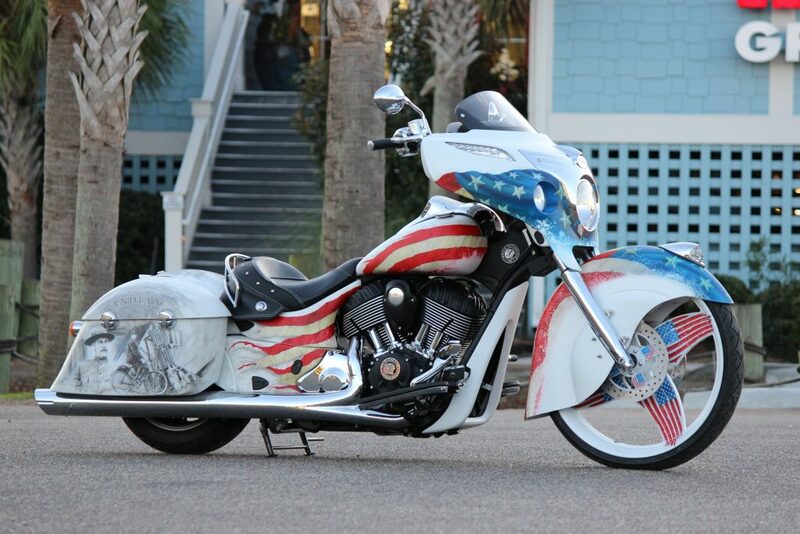 Power output was increased with the Indian Motorcycle performance cams, intake and a handmade stainless exhaust. Those, paired with aggressive styling, stunt-inspired bars and controls, bring the bike to an unprecedented level of comfort, ability and aesthetics. The standard 2017 Chieftain and Chieftain Dark Horse are baggers with an undeniable presence. Both are powered by Indian’s Thunder Stroke 111 engine and feature a 100 Watt premium audio system, TPMS, ABS, fairing with integrated driving lights and power windshield, cruise control, remote locking hard bags and keyless ignition. 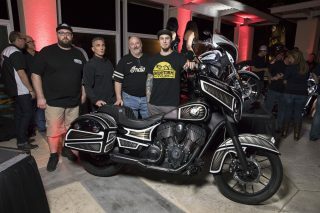 Plus, with more than 300 authentic Indian Motorcycle Accessories available, they’re also bikes that are easy to make your own as the contest has shown. See the original 10 Chieftains that entered the contest here.